I don’t know about other places but Singapore has one of the most alluring back alleys. In my five years of life here, I’ve come across some beauties in Tiong Bahru, Geylang, Jalan Besar, Kampong Glam, Joo Chiat and Bras Basah. There must be countless more in many other neighbourhoods waiting to be noticed, admired, talked of, written about by some passersby who’s using it as a short cut to the next parallel road or to the car park this very moment. I hope he’d slow down and look around. I know, I’ve always wanted to find a proper excuse to linger in these intimate spaces that have way too much character. Without startling the wayward neighbourhood cat or the dumpster diver, the only way to do this was to sit down and draw this beautiful mess. This is the back lane of Seah Street. To combat overcrowding, back lanes were retrofitted to already existing shophouses in the early 20th century, to provide access for fire fighting, drainage and ‘scavenging’ – which in this case refers to allowing night soil carriers to collect human waste from each house. Thankfully those days are behind us! And so I did. 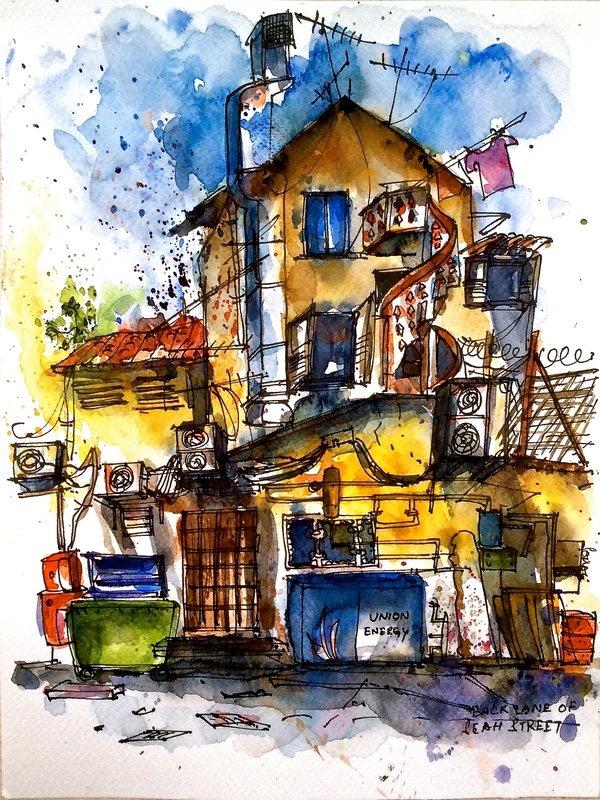 As you can see, there’s a lot going on, each element adding to the overall characteristic of this grubby stretch – a large green dumpster, a chipped wooden door, a spiral staircase, air conditioners, ducts, vents, cables, wires, pipes, switchboards, broken wooden planks, windows, wired fence, tinned roof, tiled roof, a bamboo pole sticking out with wet laundry, cracks, damp stains, spots, litter, cobwebs, weeds and what not. Don’t miss the bright red drum cylinder on the bottom right, used for burning offerings during the hungry ghost festival. And this is only a small section of the alley that I captured in the 15 minutes I had. There’s so much life in here! A beautifully grubby back alley in Geylang Serai. And not all of it is still. While I was here, I met the back alley denizens. They were mostly in uniforms – chefs, cleaners, waiters, drivers, some sitting on their haunches, smoking, others unloading a truck of supplies or sweeping the litter or rushing out of the hot restaurant kitchens to get fresh air. It would’ve been business as usual except I was turning out to be a rather amusing distraction with my yellow stool, sketchbook and all. At first they ignored me, only stealing furtive glances, but when they saw me staring forlornly at the squalor for a prolonged period, they warmed up. Each of them came over to chat, but mostly to criticise my work. It seemed like the obvious thing to do. And they were brazenly forthright. Amid snorts, grunts and sterile stares, I may have snagged some approving nods. 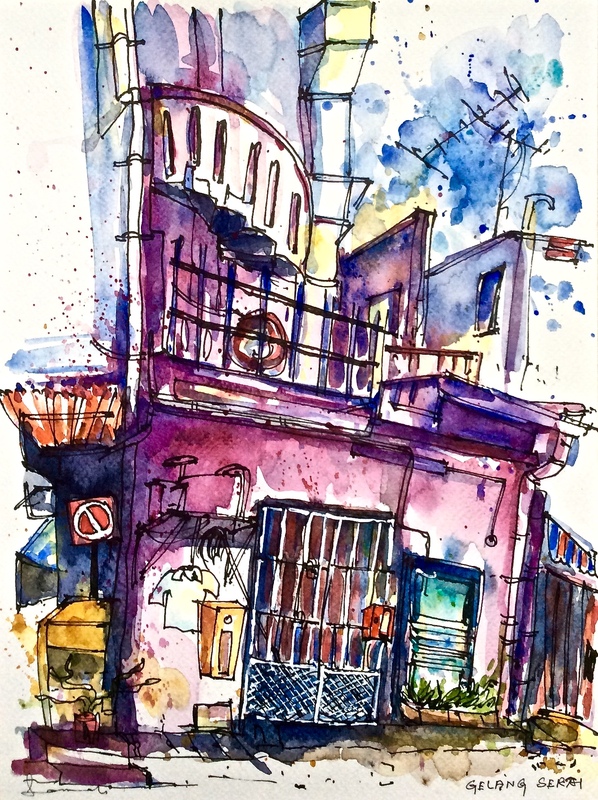 This entry was posted in Daily Vignettes and tagged Back Alleys, Bras Basah, drawing, Geylang, Geylang Serai, illustration, Joo Chiat, Seah Street, Singapore, sketchbook, Travel, urban sketching on May 5, 2015 by Somali Roy.